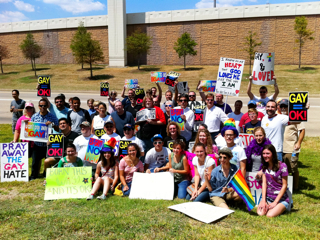 Truth Wins Out joined Resurrection MCC in Houston on Sunday to protest Exodus International’s “ex-gay” road show Love Won Out. The demonstration outside a Baptist megachurch in Sugar Land, Texas drew 70 protesters who imparted the message that LGBT people are fine the way they are.The protest was assisted by Dan Savage’s amazing “It Gets Better” project which had an airplane fly over downtown Houston, as well as the anti-gay conference with with a huge banner reading: You Can’t Pray Away the Gay: It Gets Better. The group holds the Love Won Out conferences four times a year throughout the country. And wherever Exodus International heads, critic Wayne Besen follows, gathering locals to protest the group. The event included an officer from the Sugar Land police force that deliberately harassed and ticketed me for allegedly jaywalking. It was clear that this was rogue cop with an attitude problem. The other officers on the scene had been easy to get along with. There were also a few fundamentalists who came into the protest to argue scripture, showing that they were both ignorant of the Bible and homosexuality. While our protest was a success, Love Won Out continues its decline, with perhaps a record low attendance of 450 people in the nation’s fourth largest city. The failure of Exodus at home is one reason the hate group is increasingly pushing its destructive message overseas in nations where LGBT people are unable to defend themselves for fear of persecution and even violence. The protest capped off a week of educational actions to counter the “ex-gay” myth. Special thanks to Mark Eggleston of Resurrection MCC and his partner Darrin Brindle for hosting a week of events and for their warm hospitality.